This is an excellent Body Language photo of the four of the Congressional "Super Committee" members (United States Congress Joint Committee on Deficit Reduction). Most notable here and in most in focus is Rep. Fred Upton R-MI (light colored shirt and only one not in a suit jacket). His hands (and eyes) are in sending several messages in a group of simultaneous gestures. Notice how Representative Upton is covering his mouth - as are three of the four men pictured here. In this context, it is a signal of strong disapproval and even disbelief of the speaker (unseen) or the opinion being voiced. Mr. Upton's mostly interlaced fingers indicates negative/frustrated/defensive emotions and perhaps impatience (as does his democratic colleague to his right, Rep. Jim Clyburn D-SC). Upton's index fingers are meeting in a modified, partial steeple which is an extremely common nonverbal in a person of authority. A steeple, particularly a high steeple indicates confidence - however this is a partial steeple - ergo a lower level of confidence. The steeple gesture (particularly a full steeple) should be used only briefly and in well chosen times and settings as it often sends signals of arrogance and condescension. Thumbs on the chin is often a sign of true thought and consideration (note the Committee Member two seats to Mr. Upton's right - while not fully visible, probably has his thumb on his chin as well). 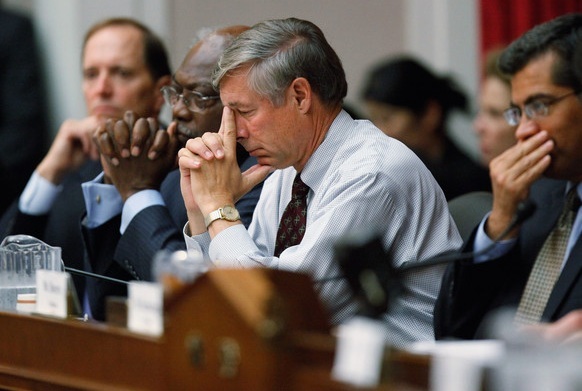 Finally notice Fred Upton's eyes are mostly or entirely closed. This is a blocking signal - in effect Mr. Upton's subconscious is wishing whatever he is hearing/visualizing away for a few seconds. This is a very complex body language photo (still only partially analyzed). Of course in the real world in which we all live and work is in a constant state of flux with words being spoken and many other distractions ....and they won't hold still for us to dissect.